This chess DVD introduces the viewer to a very solid chess opening – the Slav Defense with 4….a6, also called the Chebanenko Variation or Chameleon Variation. The chess DVD is structured with the first four clips devoted to sideline variations which are not especially dangerous but are played frequently, and as a Slav Defense player you should be familiar with the most effective ideas on how to play against these sidelines. The second part of this DVD is more complicated and analytical as I will introduce the two main lines with 5. c5 and 5. e3 that are the most challenging for black to face. These variations are quite complicated and require some memorization as employing precise move orders is critical for success. I advise many of the viewers to watch this section more than once to make sure you understand all of the main ideas and subtle concepts. The Slav Defense, Chameleon Variation has two general advantages. Firstly to compare it with many other modern chess openings, the amount of variations you need to be familiar with is really quite small. For example if you want to play the Gruenfeld Defense you will have to memorize at least 5 times more lines as compared to playing the Chameleon Variation of the Slav Defense. In fact the Chameleon Variation of the Slav Defense is more like a classical chess opening in that it relies heavily on understanding of general concepts and ideas over strictly memorizing the forcing moves that lead to an endgame (as is often the case in today´s chess theory, unfortunately!) The second advantage of the Slav Defense with 4. …a6 is that in every variation black is guaranteed to obtain active counterplay. With accurate play, there are no lines where black will have to stay under pressure for the entire game to try to hold a draw with no chance of winning. Of course white can simplify the position, for example as in the 5. cxd5 Exchange Variation – but then we will simply have a game with equal opportunities and black will still retain excellent chances to fight for an advantage from the opening. There is no doubt that the Chameleon Variation of the Slav Defense with 4. …a6 is a highly interesting and attractive choice for any chess player`s opening repertoire. 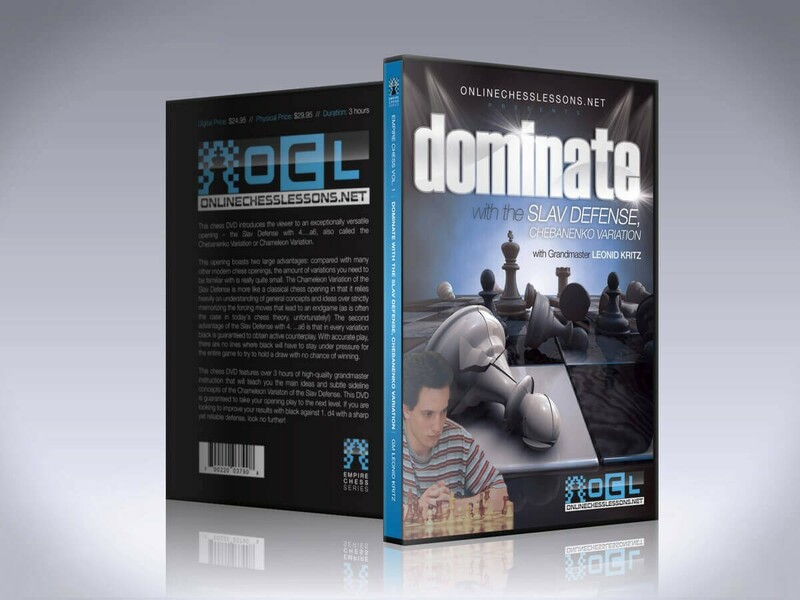 This chess DVD will teach you about the main ideas and subtle sideline concepts of the Chameleon Variaton of the Slav Defense – and is guaranteed to take your opening play to the next level. If you are looking to improve your results with black against 1. d4 with a sharp yet reliable defense, look no further!